I haven’t even listened to it yet, but I have this intense fear that I break every single commandment. Hey, just wanted to let you know that the Striptease banner over on the side actually links to Girl Genius. 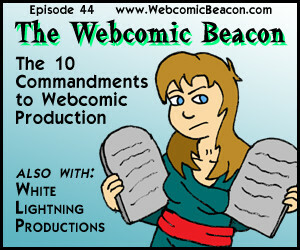 I pretty much agree on all of those commandments. This is a real comic killer!!!! How about though shall not shove your political views down thy reader’s throat? I’d say, instead, observe the sliding scale of Political Comedy. Comedic value is Inversely Proportional to the heavy-handedness of one’s Political stance. this could also be referred to as the “Sandra Bernhardt Rule”.